I’ve had the fortunate pleasure of riding to exhaustion and once at that point to where my mind starts to wander about the finer things in life like high thread count Egyptian cotton sheets and plush pillows, I’ve had to find strength to push on to the destination. Nobody likes riding tired and it sure isn’t safe, but it happens and you’ve got to be prepared for it and its implications. I remember when I was a ripe 17 years of age curious to experience sleep exhaustion. At the time I’d been thinking about serving and knew this would be the type of thing I’d experience. Why not get a taste beforehand? The memory is vivid. It was the winter of 2000 and I managed to stay awake for 84 hours and to no surprise I didn’t do that well in school those days. During this time I worked on my focus in ways which I now consider completely insane, though nonetheless the abilities I discovered were interesting and encouraging. You learn what you are truly when you push past what you’d thought may be your limit. Now though, I’m a lot older and sleep exhaustion just leads to a cold, foggy mind, and very short attention span. One particular memory of being just utterly exhausted was when I had only one evening to put 400 miles on a new motor before a 2,500 mile run down south. 1,000 miles to break it in and I was at 600 and I’d still needed time to get the oil changed before the trip. I had two days. I began around 4pm and rode straight out to Western Mass by Great Barrington. Darkness does a number on the mind. Try riding tired during the afternoon and do the same in the evening. It’s just not the same. When you’ve got just one night to put on a few hundred miles there is no way around the challenge of feeling too beat to ride on. That was a long night that finished around 2 AM. I think I may have slapped myself in the face several times to stay awake. Not the best tactic, but hey it helped! There is science behind getting tired in the evening, of course. The production of melatonin (hormone that regulates the sleep-wake cycle by causing drowsiness and lowering the body temperature chemically) is actually inhibited by light to the retina and permitted by the onset of darkness. So, it’s no surprise we feel more tired in the winter when it gets dark earlier for example. I’ve read also, that there is likely a relationship between being sleep deprived and pupil size and stability. Someone who is well rested should be able to maintain their pupil size in complete darkness for 15 minutes. As you are more sleep deprived the pupil size becomes less stable and fluctuates. Overall, the size will shrink. Now, because as humans we are able only to focus on a very small point at the center of our vision about the size of a quarter, as we become more tired in darkness our ability to focus on the road, other cars, deer on the side of the road becomes inhibited severely. More recently, from our Sturgis trip unexpectedly the first leg from Malibu to Las Vegas had me the most tired I’d been ever on a motorcycle. We got into Vegas at 1AM which given the time change had most of us at 4AM. That combined with straight highway and moreover going through the Mohave Desert where it was in the 90’s had me seeing double and doing everything imaginable to stay alert. Roughly, 350 miles of just straight highway with everyone from LA racing down 15 excited to get to Sin City. Fairly certain half of them were boozing already which really helped the cause! The other experience was on the way to Sturgis. One of our bikes broke down which left us literally sitting in the breakdown lane on a long stretch of highway in Montana. By the time we got out of there it was dark and our arrival was now expected to be 4AM. The two road glides with HIDs rode side by side as the remaining 4 of us rode behind. I think the final count of deer seen on the side of the highways was around 20. Finishing the last couple hundred miles of a 500 mile day on the highway constantly on the look out for deer while trying to remain awake amongst re-routed roads due to construction was amongst the toughest rides to date. – Stop every 75-100 miles for gas, caffeine, food and water: we always stop every 100-130 miles as it is. This way you break up the ride, become more confident as you go as each 100 is a notch on the belt where you’re closer to the finish. – Change riding position: sounds trivial, but remaining dormant for too long makes you complacent and you’re more likely to become less alert. – Sugar is your friend: sugar like caffeine will spike your blood sugar and then drop it to a low, but when tired and the end is in sight a consistent small dose will give you what you need to remain on your toes. Nobody likes riding tired, but there is almost nothing that can be done to avoid it in all situations so next time you’re confronted with this challenge take the right steps to keep you safe. 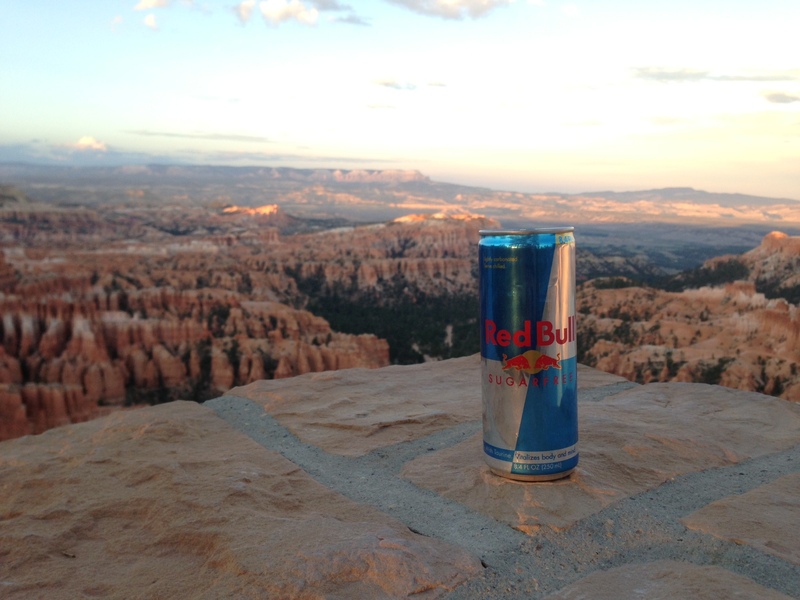 We’d like to formally thank Red Bull for all their help during these exhausting rides!